The Carlsen portable screw sumps have been specifically designed to work in conjunction with either the Waukesha 130, 220 or 320 must pump. Once again, Carlsen's easy to use variable frequency controls allow complete regulation of sump function. The portable screw sump fits under the Vega destemmer-crusher with easy access. The start/stop control on the screw sump can be coordinated with the must pump so that starting or stopping the sump will simultaneously activate or deactivate the must pump. 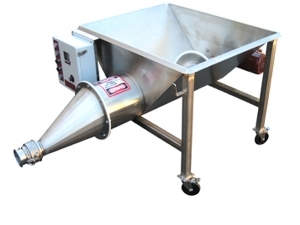 This sump is portable and sits under discharge of the destemmer-crusher. The start/stop on the screw sump will coordinate with the must pump control so that starting and stopping the sump will also start and stop the must pump. This screw sump will pump whole cluster whites to the press, increasing the press's loading capacity.